A wiki describing studera.nu, and how to apply to a master’s programme in Sweden has been launched by Andrei Neculau. This is the evolution of his blog, which he created in response to the difficulties he had with studera when he applied. The usual disclaimers apply, this is not an official wiki from studera, but it’s packed with information and should help with the application, and post application, processes (which Andrei calls ‘war’ and ‘purgatory’). Apart from the fact that this is incredibly useful for people making applications to study in Sweden it’s also a great example of the future of the web (dare I say it, ‘web 2.0’). As it’s a wiki, it’s totally interactive and, crucially, not ‘owned’ by studera. Maybe in the future we’ll start seeing students creating their own university websites which become as useful, if not more so, than the university’s own website? Studera.nu relaunch English website for applications- what’s your opinion? Is it better? Studera. nu, the national online site for making an application to study in Sweden have launched their new English website today. I have not experimented with it yet, but – more importantly – I’d really like to know what the real users opinion of it is. If you’re a student who has used it, either to make an application or prepare for one, I’d really like to know how well it works. Just leave a comment below – thanks! The latest results from the online survey we been running on our www.lu.se/english website are in, and – no surprise – the biggest complaint our users have is with study information. The most important task is looking for courses, and it’s also the most common source of usability problems. – What were you looking for today? – Could you find what you were looking for? We got 577 answers (which is less than 1% of our website traffic) but we have captured a valuable insight into our users’ experiences of the website – the ‘voice of the customer’, as Avinask Kaushik calls it. 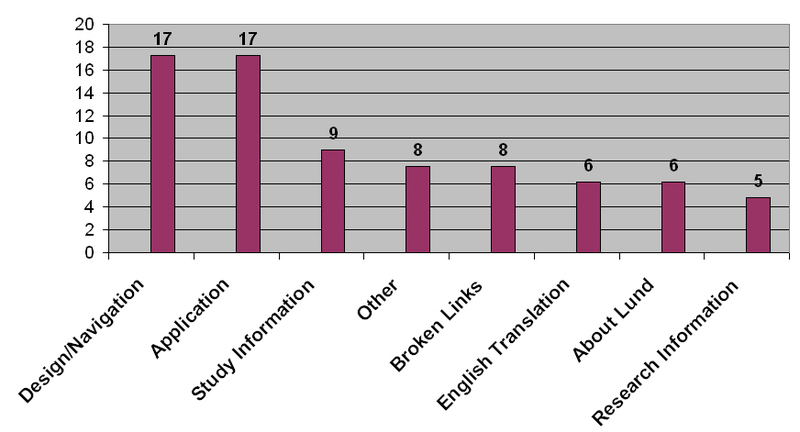 I would not suggest planning an entire overhaul of the website on the basis of these data alone but, in combination with the recent usability studies and other, secondary research, it continues to support the case that finding study information is the number one task on our website. Here’s the survey results in their full, unfiltered form. The single biggest issue is the lack of study information – and this totally reflects the varying quality of our education database’s content. 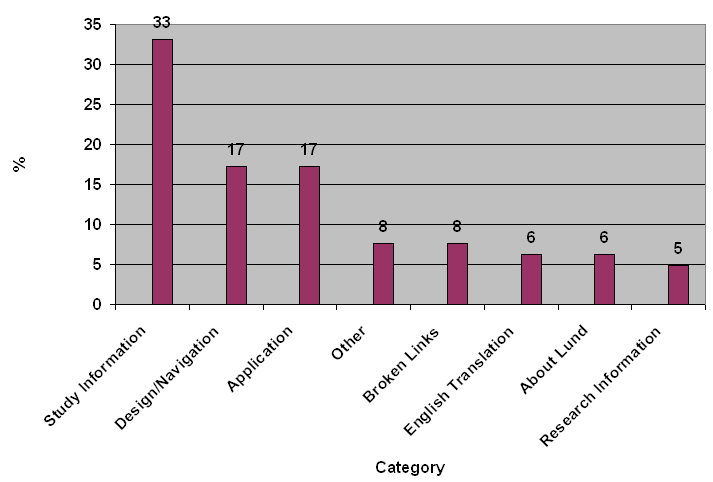 The design of the site, and its navigation, occupy joint second place with application content as being barriers to usability. The good news is that the content of the database is fixable, and requires no technical input to do so. Similarly, the application content can be improved without any major expense. The navigation issue is a deeper question and requires more analysis.